Born and raised in southern California, Temitope began practicing yoga asana in earnest after a series of revelatory life experiences, leading him to his first class at Santa Monica Power Yoga, which turned into a daily ritual over the years. Coming from a football strength training background, yoga practice shed light on new ways of nurturing long term strength, balance and flexibility. 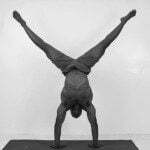 Temitope relies on the breath and prana/qi/ase to guide his life, practice and class. A slow progression of hips, core, and below, to create a nice boil. Followed by a long sweet cool down. This class is focused on hamstrings and balance. A full practice finding length, building lower body, and core strength.